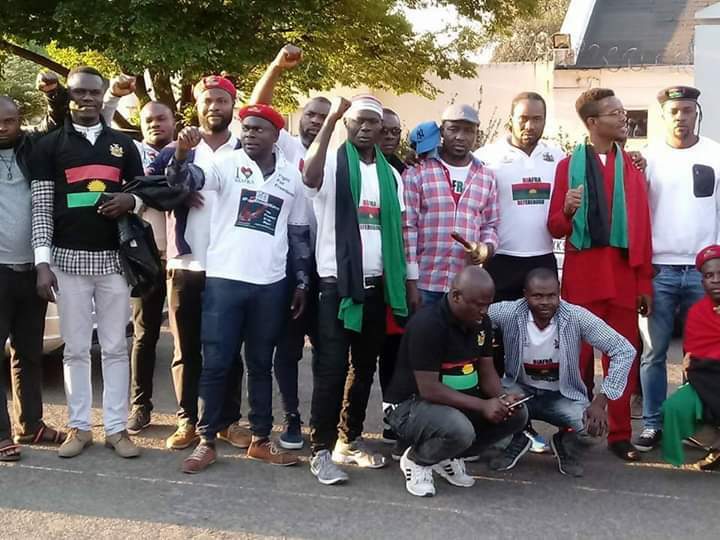 JOHANNESBURG— MEMBERS of the Indigenous People of Biafra, IPOB, in South Africa, led by their national coordinator, Mr. Isaac Chidera Samuel on October 6, 2018, stormed an event for the celebration of the annual new yam festival organised by the pan-Igbo socio-cultural organization, Ohanaeze Ndigbo, to demand the whereabouts of their leader, Nnamdi Kanu. The event which was ongoing at the Observatory Sports Club in Johannesburg was interrupted by the irate IPOB youths who told the congregants that they have not come to join them in the celebration of the new yam festival but to register their displeasure as well as to convey their message to their President-General, Chief John Nnia Nwodo. Although some members of Ohanaeze did all within their powers to stop the IPOB members from gaining access into the entrance of the event, the youths clad on Biafra-coloured uniforms and armed with a large banner emblazoned, ‘A Call for Referendum Is Not A Call For War,’ and ‘Free Nnamdi Kanu’, eventually made their way through the entrance, into the event. They seized the opportunity to make case over the unending and incessant killings and enforced disappearances of Biafra agitators in Nigeria, urging them to support IPOB’s call for referendum. Addressing the audience after observing a minute silence for those that died in the struggle for independence, one of the leaders of IPOB in South Africa, Mr Chukwudi Obiukwu(SADC Rep) said although IPOB is a peaceful and non-violent movement, she wouldn’t forgive those standing on her way to attain freedom for her people. According to him, “You all gathered here can testify that IPOB are peaceful and non-violent freedom fighters but we don’t forgive our enemies and those who have sworn to sabotage our efforts in the pursuit for freedom. “It’s sad and unfortunate that Nnia Nwodo is not here but we have one or two words for the person he sent to represent him. Nnia Nwodo and co cannot be at home while our people are been killed and decimated and nobody would condemn such act. It isn’t done anywhere. While praying for the downfall of saboteurs whom have collected money to fight against Biafra’s independence as well as those who has hands or contributed in one way or the other in the disappearance of the IPOB leader, the youths cautioned the Ohanaeze scribes not to hesitate in serving their nation, Biafra. Also in his remarks, the National Secretary of IPOB in the country, Emmanuel Isimmiri while cautioning the Ohanaeze Ndigbo elders at the event, stated they have no intention of hijacking their programme but that if they should fold their hands and watch while things grew worse without doing the right thing, then they should expect less of them when they eventually occupy same positions in the future. “We’re using this privilege to talk to the indigenous people of South Africa and our elders who are here in my presence. Looking at the age bracket here, I see fathers. There’s a saying in my dialect which says that an elder doesn’t stay at home and watch a domestic goat die while giving birth. “The ethnic cleansing going on in that central state of West Africa, precisely in Biafraland are you all not seeing it? I don’t want to talk about the unlawful arrest, I don’t want to talk about all the inhumane treatments orchestrated against Biafrans everyday but my banner here says that self-determination is not a crime and we’re using this privilege to talk to our elders. “If you call yourself an elder, then you need to act like an elder. We’re not here to hijack the festival, it’s part of our culture but we’re looking into you as a role model because tomorrow, we will sit on that seat you’re occupying today. But if you don’t do what is right now, don’t expect us to be good leaders tomorrow. “Lastly, we’re calling for a referendum. As we all know that there’s a wrong notion circulating on social media that referendum means war. I want to use this platform to remind you that referendum is not a call for war, it is a call for total freedom of every Biafran born and yet to be born. “When we talk about referendum, we talk about total freedom of every Biafran and inside that total freedom, we talk about equality. Equality is not limited to gender, it’s not limited to the issue we’re facing there in Nigeria called ‘ethnic minority,’ neither is it limited to the issue of language, diversity and multicultural nature of that contraption,” he posited.